This Italian Life: AUNTIE PASTA: Oh Stuff It! CHIAVARI, Italy – Truthfully, with the heat wave we have had the past few weeks; no one has really been in the mood to cook. The bustling morning market hasn’t been bustling as much as crawling, but that all changed the other day when a cool breeze began to blow in off of the sea. With the morning temperature a more agreeable 80° F there was a bit more activity at the market yesterday. Watching to see what the Chiavarese mamas were buying, it soon became obvious they were choosing plump peppers, eggplants, zucchini and tomatoes. The Genovese have a real fondness for stuffed vegetables and I have a sneaky suspicion that is exactly what the mamas had in mind. The beauty of stuffed vegetables is that you can fill them with almost anything, bake them in the oven, and they won’t disappoint you. It is a tasty way to make something delicious out of the little bits of left over this and that in the fridge. Living in Genova greatly expanded my love of stuffed vegetables far beyond my mother’s peppers with rice and ground beef. Or it could be that just being in Italy makes everything taste better. Hidden in the alleys of the city’s historic center, there are take-out food shops, no bigger than a closet that sell stuffed zucchini and stuffed onions alongside trays of farinata and foccacia. It takes a strong will to walk past one of those shops without being drawn in, and I can’t say I’m particularly strong willed. 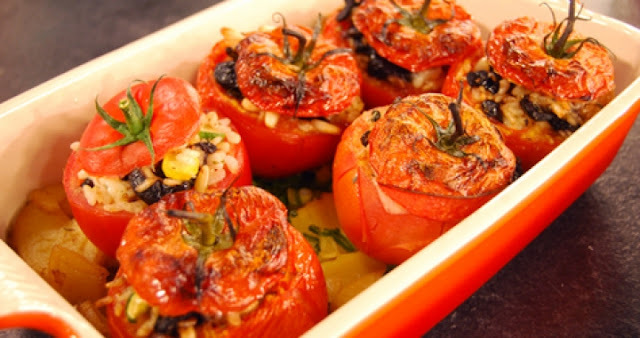 Stuffed vegetables are also easy to make at home. One Genovese mama I know makes stuffed zucchini using the scooped out center of the zucchini mixed with small chunks of ham and a béchamel sauce. Then she sprinkles the stuffed zucchini with breadcrumbs flavored with olive oil and grated cheese and pops them in the oven to heat through and brown the breadcrumbs. Another variation of the zucchini filling is bread (the soft white center) soaked in milk, breadcrumbs, Parmesan cheese, and a variety of herbs, preferably marjoram, and eggs to bind the mixture. 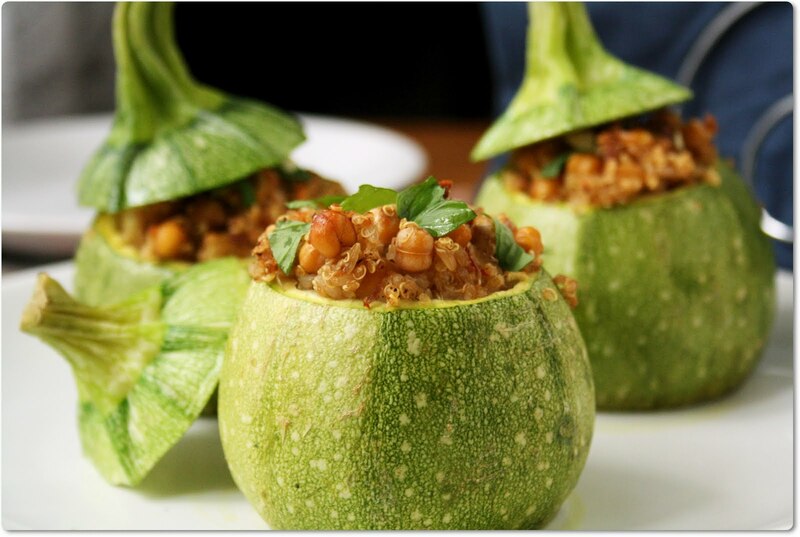 Fill the zucchini with the milk soaked bread (squeezed dry of course), herbs and egg and top with the breadcrumbs. The flavoring agents depend on what vegetable is being stuffed. 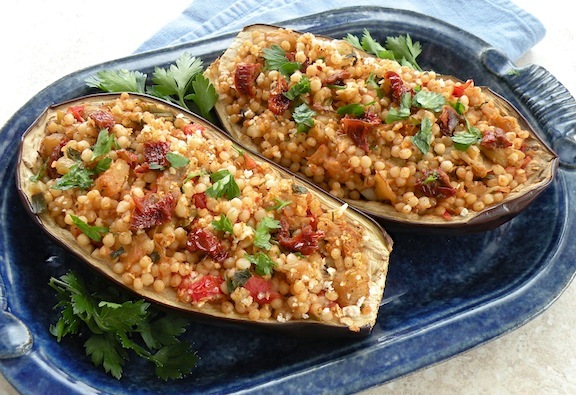 For eggplant, you might want to add chopped porcini mushrooms plus a little garlic and oregano. When stuffing zucchini and onions, try leaving the mushrooms out and throw in a pinch of nutmeg for good measure. You can also use mushrooms as part of a bread stuffing for artichokes, while chopped parsley is good added to the filling for stuffed tomatoes. The artichokes recipe also calls for the chopped stalks of the artichokes, chopped leeks, oregano and nutmeg. Best not to waste anything isn’t really a Genovese motto, but it could be. Here’s an easy stuff tomato recipe from the Corriere della Sera, Milan’s daily newspaper. Wash the tomatoes and cut off the tops. You can also cut a very little bit off the bottom so they stand up better. Scoop out the inside of the tomatoes, chop it into pieces no larger than the peas, and set it aside. Chop the onion, the carrot and the zucchini also into pieces no larger than the peas. Put a small amount of extra virgin olive oil in a frying pan and add the chopped onion, carrot and zucchini, the ground beef, the rice, a cup of water and let it cook together for about 10 minutes, or until the water is absorbed. Fill the scooped out tomatoes with the rice and ground beef filling, and cover them with the tomato tops. Drizzle a little olive oil over the top of them and then place a small amount of extra virgin olive oil in a casserole pan and bake in a preheated oven (160ᴼ C/325ᴼF) for 40 minutes. The recipes calls for making a sauce out of the chopped tomatoes and serving the stuffed tomato on top of it, just as you see in the photo, but to tell you the truth you could just as easily add the chopped tomatoes to the rice and meat mix and reduce the amount of water, or leave it out altogether. You can use this filling for any vegetable you want to stuff. You can substitute the rice with couscous or the soft center of Italian bread, or tiny pasta, or leave them out as well and just chop the vegetable centers you’ve scooped out, either with ground beef, lamb or pork, or no meat at all. You don’t need peas or carrots either, but you do need onions. Hmmm, just thinking about these delicious combinations is making me hungry. I think I'll head for the kitchen and rustle me up some grub Italian style. Buon Apettito.